The MOE-K2 Grip combines reinforced polymer body construction with comfortable, wrap-around rubber overmolding for maximum weapon control in adverse environments. Similar in concept to the smaller MOE-K, the MOE-K2 is a drop in upgrade for AR15/M4’s that offers a more vertical grip angle, but in a full-size grip design. 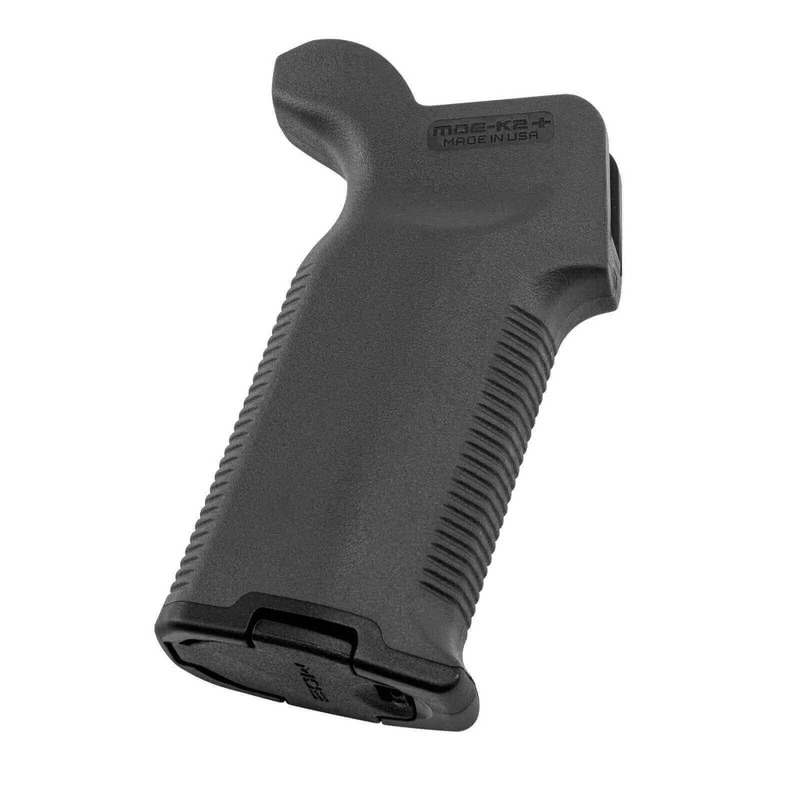 The steeper vertical grip angle is optimized for use on PDW (Personal Defense Weapon) configurations and improves comfort and control on short LOP rifles that bring the primary hand in closer to the shooter’s body. With the rubber overmolding for positive weapon control, compatibility with optional Storage Cores for gear stowage, and a unique backstrap design for proper trigger finger placement, the K2 brings modern styling, ergonomics, and comfort to the AR platform. All mounting hardware and a basic grip cap included. Made in U.S.A. NOTE: This grip will function properly with 7.62 NATO AR10/SR25 style of rifles but, depending on the make of the rifle, may or may not leave a gap between the backstrap’s ‘beaver tail’ and the receiver. This gap is purely aesthetic and will not affect function. Picking out one of the many accessories for an AR isnt easy, but checking out was simple and got my pistol grip real quick. Magpul makes great products. This is certainly a quality product way above the plastic one. I bought 4 of them and plan to outfit all my rifles and pistols with this one. As for AT3, I just found these guys by chance and glad I did. They are awesome and if you have a question they will respond quickly and shipping is fast. Dare I say I love these guys already? Good price, good quality, quick delivery. I'll be back. The products are great but what is really awesome is how fast this shipped to me. I got it in less than 24 hours. I only wish they carried more Olive Drab Green inventory.